What is the Return to the Source? The US State Department’s formal recognition of the Syrian Opposition Coalition (SOC) is no small occurrence in the imperialist world’s campaign to topple Syrian President Bashar al-Assad. To pretend, as many on the US left do, that the US and France have not actively struggled against Assad by materially supporting the rebels is no longer possible, even from a standpoint of technicalities. Arms and ammunition continue to flow to the rebels in Syria, and whether this lethal aid is delivered by the Central Intelligence Agency or puppet regimes in the Persian Gulf makes no difference to the fundamental imperialist mission afoot in Syria. “Some people never learn.” That’s the conclusion one reaches from reading the shameful coverage of the unrest in Syria by the plethora of ostensibly ‘left’ groups in the United States. In the same way that groups like the International Socialist Organization (ISO) revealed their heinous liberalism in regards to Libya, this chorus of ‘left’ groups have joined again in defense of the Syrian opposition movement, who began protesting President Bashar al-Assad’s government in late March. 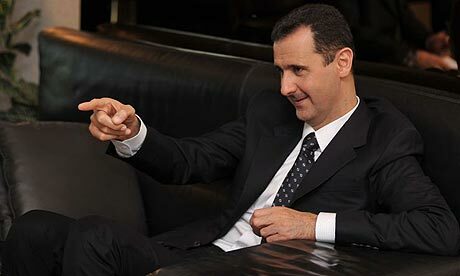 A close examination of Syria yields three important conclusions: (1) Marxist-Leninists and anti-imperialists should unequivocally support President Assad’s government against the US-funded opposition, (2) President Assad’s government is the most progressive state in the Middle East, and (3) the ISO’s position rejects Leninism and offers de facto support for imperialist aggression towards Syria. Western ‘leftists’ embarrassed themselves on Libya. Wallerstein’s article is an embarrassment. In fact, Venezuelan President Hugo Chavez was correct in warning Gaddafi of imperialist intervention. Obama did not “resist” the imperialist desire to invade Libya. Russia and China did “go along with it,” at least insofar as they refused to veto the UN’s no-fly zone resolution; the same resolution that Wallerstein said would never happen. If only Wallerstein was an anomaly! Socialist Worker, the ISO’s newspaper, published a slew of anti-Gaddafi articles in the days leading up to the NATO invasion. Bending over backwards to justify the Libyan rebels’ cause, Socialist Worker re-published an article with the absurd title, “The West’s fear of Qaddafi’s fall,” on the front page of its website. (5) Like Wallerstein, the article tries to argue that NATO’s threats are only political posturing because Qaddafi’s government serves the interests of imperialism. Also like Wallerstein, NATO’s invasion completely discredited the article’s content. Time and time again, these so-called ‘leftists’ get into bed with reactionary tools of imperialism. Nearly any group that opposes the laundry list of governments that the ISO opposes can count on the organization’s support, provided they can turn out at least a couple hundred people to a protest. 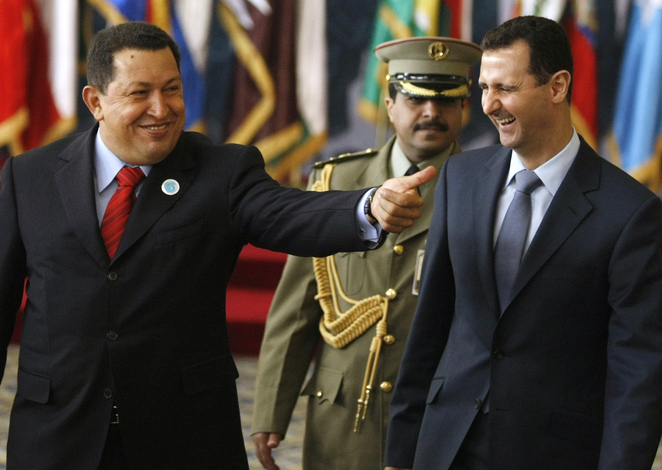 President Chavez was right about Libya because he understands imperialism. Western ‘leftists’ embarrassed themselves because they don’t. Additionally, Syrian communists play an important role in the government and are allowed to organize separate from the Baath Party. 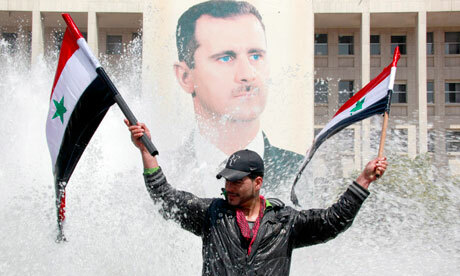 Unlike the experience of communists in Iraq–who faced repression from the Baath state, led by President Saddam Hussein–Syria’s two communist parties are leading members of the ruling National Progressive Front, and have representation in the People’s Council of Syria. The Wikileaks cables confirm that “money was set aside at least through September 2010,” which proves that regime change in Syria is the official policy of the Obama Administration. (14) That Barada TV emboldens and functions as the organizing arm of the Syrian opposition is a testament to the centrality of imperialism in this so-called ‘uprising’. Whether some of the individuals in the Syrian opposition have legitimate grievances with President Assad’s government or not, this movement functionally advances the aims of imperialism: to remove a popular anti-imperialist government in the Middle East. 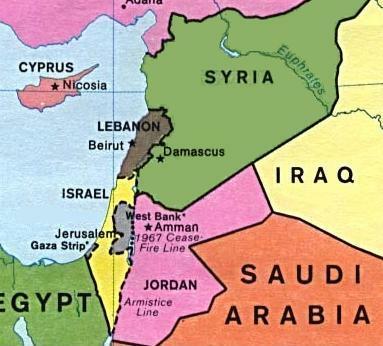 Given the Assad government’s support for the Palestinian and Lebanese liberation struggles, the West understandably views Syria as a threat to hegemony in the Middle East. 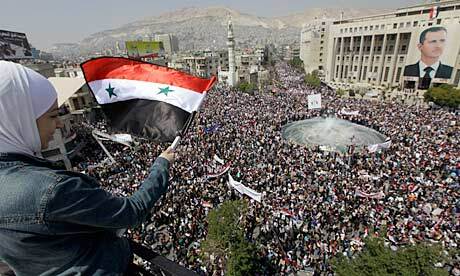 However, Syria has never fit into the crude Islamic fundamentalist threat that the US uses to fuel the war on terror. Unlike neighbors like Iran, Syria is a secular state that explicitly protects the rights of Muslims and Christians alike. Nevertheless, the West viciously opposes Assad’s government and fears its acquisition of nuclear power, indicated by Israel’s 2008 bombing of a Syrian nuclear facility. 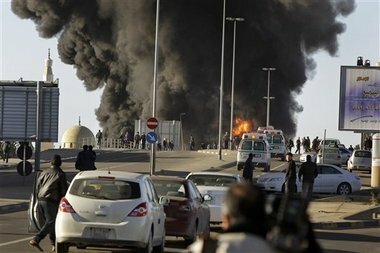 Had Syrian unrest reached a boiling point two weeks earlier than Libya, NATO might have directed its attention at toppling Assad’s government rather than Gaddafi’s government in Libya. The ISO is wrong on Libya and Syria. The last sentence is particularly telling since the implication of “little trust in the government or its official news agency” is that some other news organ has garnered the trust of the Syrian opposition, namely Barada TV. Indeed, the vicious smear campaign from this US-funded TV channel would undermine some people’s trust in the government because its objective is to topple the Assad government. Why does this article from Socialist Worker, published four days after Wikileaks revealed that the US was funding the Syrian opposition, mention nothing about this blatant violation of national sovereignty? What an opportunistic criticism for Khalil to make! The ISO does not support Hezbollah or the other national liberation groups supported by Syria, yet they denounce Assad for not supporting these groups enough. Khalil understands that the facts don’t support his conclusions, so he opportunistically pivots away from the ISO’s position to levy a critique of Assad’s government. Once again, the article mentions nothing about Wikileaks revelation of overwhelming US support for the opposition movement. Additionally, Khalil mentions nothing about the wave of pro-government rallies that took place simultaneously with and dwarfed the size of the opposition’s protests. (19) The omission of these facts reveal that the ISO is more concerned with maintaining theoretical consistency with its bankrupt Trotskyite-Cliffite views of countries like Syria than it is with a thorough analysis of the material conditions. In the United States, the WWP and the PSL have both released statements condemning imperialist intervention in Syria. Why hasn’t the ISO? Trotskyism is alien to Marxism-Leninism, but it’s nowhere near as alien as the ISO’s bankrupt Cliffite ideology. Time and time again, their lines play into the hands of imperialism and betray the organization’s liberal political orientation. Socialist Worker continues to act as a preview of Obama’s talking points a week later. Revolutionary leftists must support Assad’s government against Western intervention, including the funding of the Syrian opposition. Click to subscribe to Return to the Source and receive new posts by email.